For at least the first day of trading, 2013 is proving to be a very good year. Investors ushered in the New Year by piling into stocks Wednesday, cheering U.S. lawmakers' ability to reach a last minute deal to avert the fiscal cliff. "What's been hanging over the markets for the last couple of months has finally been released," said Sean Kelly, a managing director at Knight Capital Group. "The rally today is 100% about the end of the fiscal cliff, and people are buying with both hands." The Dow Jones Industrial Average gained roughly 308 points, or 2.4%. All 30 Dow stocks showed solid gains. The S&P 500 rose 2.5%, while the Nasdaq spiked 3.1%. The market finished the day near its highs. Both the S&P 500 and Nasdaq posted their largest percentage increases since late 2011. Financial shares posted broad gains, with Bank of America (BAC), Citigroup (C) and Wells Fargo (BWF) rising between 2.5% and 4.5%. Credit card companies Visa (V) and MasterCard (MA) both hit all-time highs. Tech stocks also fared well, with Apple (AAPL) and Hewlett-Packard (HPQ) logging big increases. Oil and gold prices rallied too. The dollar, however, was mixed, gaining against the yen but weakening against the euro and British pound. As investors shifted into riskier assets, safe havens, such as U.S. Treasuries, sold off, with the yield on the 10-year note rising to 1.84% -- a level not seen since mid-October. Investors cheered the late-night deal reached by the House that keeps the Bush tax cuts in place for most Americans, but raises the tax rate on individuals earning more than $400,000 and married couples earning over $450,000. 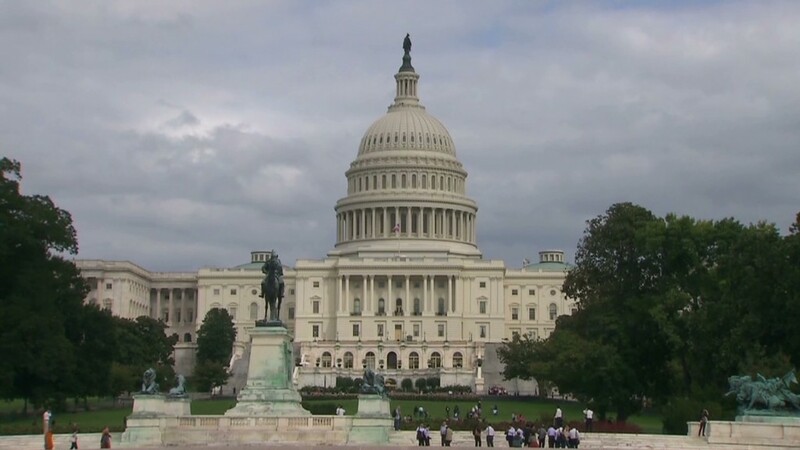 Lawmakers allowed the payroll tax cut to expire but extended federal emergency unemployment insurance benefits for another year. "This isn't the grand bargain that people were hoping for, but having the deal done gives investors some certainty," said Giri Cherukuri, a portfolio manager with OakBrook Investments. Investors ignored the downside to the deal, including Congress' failure to tackle automatic spending cuts, which are now set to go into effect March 1. Additional -- and perhaps more intractable -- challenges remain. Congress must soon raise the debt ceiling, and figure out plans for the postponed spending cuts and the federal budget. After news of the fiscal cliff deal broke in the early hours of the morning, stocks around the world soared. European markets closed more than 2% higher. Australia's ASX All Ordinaries index added 1.3%. South Korea's KOSPI gained 1.7% and the Hang Seng in Hong Kong advanced 1.9%. Japan's Nikkei and the Shanghai Composite remain closed in an extended New Year's holiday. Investors also got some good economic news Wednesday. The Institute for Supply Management's monthly manufacturing index showed activity rebounded in December. But investors shrugged off the Census Bureau's data on construction spending, which showed a decrease of 0.3% in November. Analysts had predicted a 0.5% increase. In company news, Avis Budget Group (CAR) announced it will acquire Zipcar for $12.25 a share -- a 49% premium over its closing price on Monday. Zipcar (ZIP) shares rose nearly 48%. Shares of Dole Food (DOLE) tumbled 13%, after the company lowered its earnings and sales forecasts for the year, blaming a difficult economic environment for its fresh fruit business. 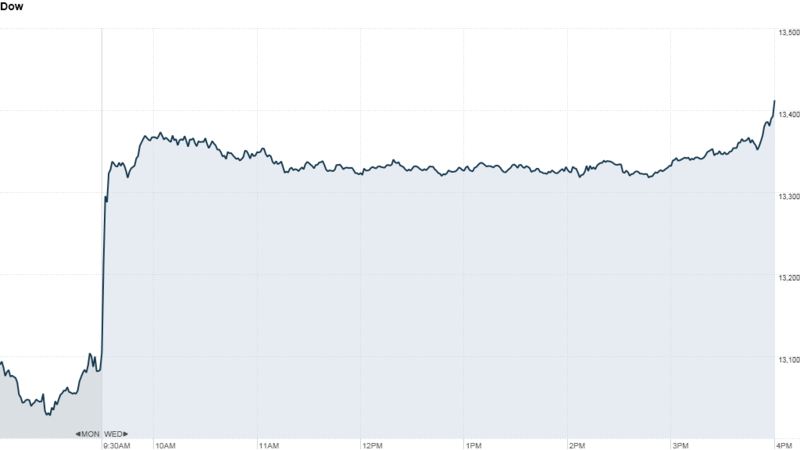 Shares of LinkedIn (LNKD) dropped nearly 2%, after it was downgraded by analysts at Barclays.